In New York, Video Chat Trumps Quarantine To Combat TB : Shots - Health News Ebola isn't the first dangerous microbe to spur calls for quarantine in American cities. But as New York City's experience with drug-resistant tuberculosis suggests, isolation isn't always best. An X-ray of the chest of a man with tuberculosis. 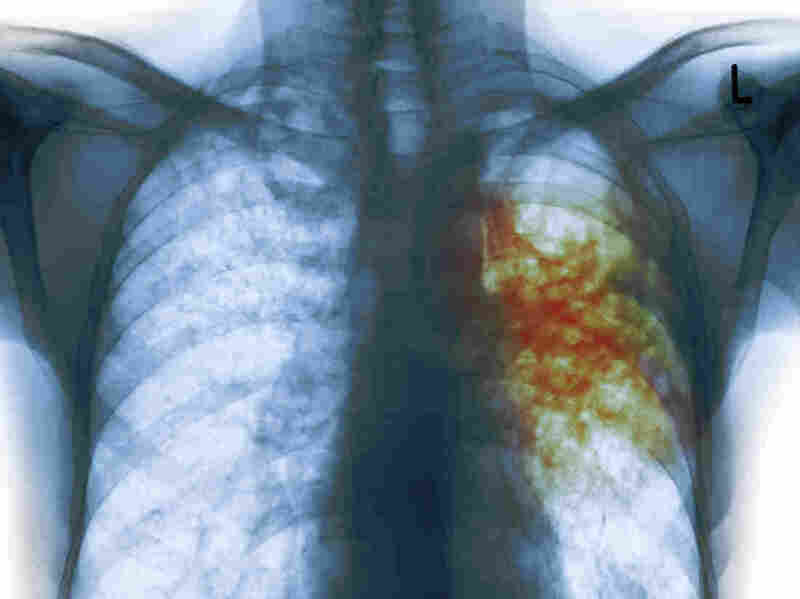 The areas infected with TB bacteria are colored red. Thirty-four-year-old Karim works long days as an investment adviser, and when he doesn't burn the midnight oil, he plays basketball or goes to the gym, hangs out with friends, or heads to coffee shops. You wouldn't know he has an especially tough-to-treat illness. "I have multiple-drug-resistant tuberculosis," he explains. At the end of the day this is something that could get out of hand. You just don't want to risk it. It is a highly contagious disease, and if you're not taking your meds, you're just putting other people at risk. It's called that, because at least two of the most potent drugs conventionally used to squelch the tuberculosis bacterium don't work on the strain of the illness that Karim has. So he needs to take a combination of drugs, with harsher side effects, for 18 months. That's two to three times longer than the traditional treatment for tuberculosis. "It has been a very stressful treatment process and a lot to deal with, but, thank God, it's all going really, really well," says Karim, who requested that NPR not use his full name out of concern he could be stigmatized for being a carrier of a disease that many people don't understand. While Americans debate whether we should quarantine people who might have Ebola but clearly aren't contagious, others wander among us who are infected with tuberculosis — another disease that's highly communicable in some forms. Close to 10,000 people in the United States have TB. Karim doesn't know how he became infected with TB bacteria, though there's a good chance it was from someone in Pakistan, where he lived until age 4. Millions of people worldwide harbor a latent (noninfectious) form of TB for decades — it only shifts to an active form in some of them when, for one reason or another their immune system can no longer keep the bacteria in check. After Karim was diagnosed with infectious TB in August of 2013, New York City's health department took over his treatment — giving him powerful medications and mandating two weeks of home isolation. Once tests confirmed that the drugs had beaten back the bacteria in his lungs to a noncontagious level, he got the "all clear" to move around the city freely again. Today, he continues to take three very powerful antibiotics every morning, while an official from the health department watches him take the pills, via a smartphone. It's the city's standard practice for all TB patients. "In the beginning, I was kind of frustrated with having to report or show that I'm taking my treatment all the time," Karim says, "but at the end of the day this is something that could get out of hand. You just don't want to risk it. It is a highly contagious disease, and if you're not taking your meds, you're just putting other people at risk." The state of New York allows the city to impose a strict quarantine on TB patients; some can even be detained in a lockup at Bellevue Hospital. But those drastic steps are only taken with highly infectious people who repeatedly don't take their medications — a small handful of people each year, according to Dr. Joseph Burzynski, head of the New York City Health Department's bureau of tuberculosis control. There's really no reason to quarantine somebody who's not a high risk to the public. "Most of our patients that get to that point have had significant substance abuse issues or mental health problems that are not being addressed," Burzynski says. "Those are the reasons they're being nonadherent." But most of the city's 650 or so residents each year who have active TB manage their treatment like Karin. Only a small number of people very close to him know he carries the disease. He thinks even if he explained to friends and colleagues that he isn't contagious anymore, they'd still treat him differently. "I don't blame people," Karim says. "I don't get angry. I understand. There are parts of my family — when they found out, there was kind of a stigma there. I don't think there's enough information about it." All the news about the Ebola virus has made both Burzynski and Karim think about how people understand infectious diseases. Burzynski says it makes sense that people are afraid of Ebola — it's frequently lethal. But looking more closely at the TB experience could ease some of those fears. "We know that patients with tuberculosis are not infectious, except when they have a high degree of disease that's not being treated and they're coughing," Burzynski says. "We know that persons with Ebola disease are only infectious once they develop symptoms and transmit the disease through the spread of bodily fluids. So there's really no reason to quarantine somebody who's not a high risk to the public." Meanwhile, Karim is looking forward to a day, he hopes early next spring, when his 18-month drug regimen will be finished, and he'll be free of TB. He says at that point he'll tell more people about his ordeal — and do more for an organization he's started working with that's trying to find better, shorter treatments for the disease. This story is part of a reporting partnership with NPR, WNYC and Kaiser Health News.